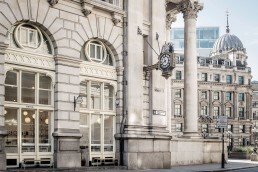 Within London’s historic Royal Exchange building, this sleek espresso and cocktail bar attracts a sophisticated clientele. It continues our studio’s collaboration with Grind & Co., evolving the design language we have developed for their other locations in Shoreditch, Soho, Holborn, Covent Gardens and London Bridge. Taking cues from the building’s rich history, we worked with a local heritage architect to develop a minimalist interior that respects the site’s past.